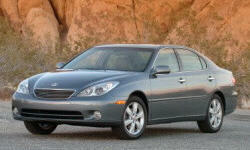 Why the 2005 Lexus ES? Almost 90K miles and no major repairs. While not the fastest car in the world ... it certainly packs a punch when you push into higher RPMs. Highway passing is a breeze. The wood and leather are wonderful. Fit and finish is outstanding. No interior rattles or squeaks 90K miles in. Why Not the 2005 Lexus ES? On the bland side and beginning to look a little too much like a pokemon character.